Mobile information technology for public security has rapidly developed because of related business opportunities and advancements in technology. Mobile police terminals have an increasingly important role in various types of large-scale security, including anti-terrorism and social stability. More than half of the police force in China, including traffic police, community police, and patrol police, works away from an office and thus requires mobile access to information. The development of mobile information technology for public security requires a new mobile police technology system. In accordance with the 13th Five-Year Plan for Public Security Development (2016–2020) and Opinions on Promoting the Construction of Basic Information, the Ministry of Public Security formulated and issued the Overall Technical Plan for National Public Security Mobile Police Construction (2016 Edition) (released in June 2016) to guide local public security to build a new generation of mobile police system based on the 4G network. A mobile system is important for the investigation and verification of a floating population. However, existing technology cannot meet the needs of public security. Domestic public security systems generally use a personal digital assistant to verify the identity of persons in a floating population and check personnel information because it is simple and convenient. However, it is difficult to deal with undocumented individuals or forged credentials in practice. Many persons of interest or suspects may thus evade police. Biometric information, including palmprints, fingerprints, DNA, and footprints, on personnel of interest and former criminals has been collected for several years. These databases, which are very large, provide data support for front-line work for verification or investigation. Although civilian mobile devices can be used to collect and verify fingerprints in the field, the fingerprint features obtained by such devices cannot be used for fingerprint matching with a local automated fingerprint identification (ID) system (AFIS) for the following reasons. (1) The fingerprint image is too small and the extracted fingerprint features do not meet the exchange standard of biometric identification information of the Ministry of Public Security (GA/T162-1999). (2) AFIS fingerprint matching algorithms cannot use the extracted fingerprint features to perform fast comparisons with massive fingerprint databases, which is required for real-time operation. (3) There is no suitable algorithm of fingerprint ID for a resident ID card launch an inquiry in an AFIS fingerprint database. In addition, because biometric data are sensitive (i.e., it can be used for personal ID), the security requirements are high. Biometric data cannot be changed once leaked. Front-line civilian police carry out verification and inventory work in villages where a floating population is concentrated or in an urban–rural fringe zone. Local wireless communication quality is poor in such locations. Therefore, transmitting a fingerprint image over a wireless network is insecure and increases the transmission load of the wireless network, resulting in network transmission delay. This study proposes a number of key technologies for mobile terminals for collecting fingerprints for fast comparison using AFIS. These technologies ensure intelligent mobile fingerprint collection and allow the transmission of fingerprint information from the terminal to AFIS, which has massive fingerprint and palmprint databases, over a wireless public security network for real-time fingerprint comparison. This study also analyzes the feasibility and effectiveness of the proposed technologies for system design and the applicability of fingerprint ID algorithms. The system was tested by the Shanghai Public Security Bureau Criminal Investigation Corps from August to October. There are collected more than 500 ID cards and face and fingerprint information in urban–rural fringe zone, and six fake ID cards were found out. This system is helpful to social stability. The proposed technologies can be divided into three parts as follows: (1) fingerprint acquisition and preprocessing at mobile terminals, (2) secure data transmission, and (3) high-speed comparison using AFIS. The process of a mobile police terminal applying for fingerprint matching over a public security network's AFIS mainly involves a handheld terminal, a request-forwarding server outside the firewall, and a transmission medium. When a mobile terminal connects to a wireless public security network, a data packet is sent to the transmission system. The data packet is analyzed and encrypted, and a request-forwarding server is selected. The server that receives the data packet (usually the request-forwarding server) transmits the data packet to the AFIS application server through a physical gateway. The details of this process are shown in [Figure 1]. The dominant mobile device operating systems are Android (Google LLC) and iOS (Apple Inc.). iOS is unsuitable for mobile police applications involving public safety because it uses a closed development model (i.e., it is proprietary software), its settings are not opening to the outside, and the working mechanism of its core software modules is unknown. In contrast, Android, which is based on the Linux kernel, uses an open-source development model. Therefore, the function of its code is clear, and the causes of problems with core software modules can be quickly located. Existing mobile police terminals thus use Android as their operating system. For a mobile police terminal to collect fingerprints and perform a comparison using AFIS, it must have a fingerprint collection and management program installed to ensure that the requirements of the customer are positively responded. When the program is running, the system management module of the program will refresh on the main thread at a certain frequency to monitor the user and important events. When an event is detected, the event dispatcher is triggered to perform task assignment according to a certain policy. 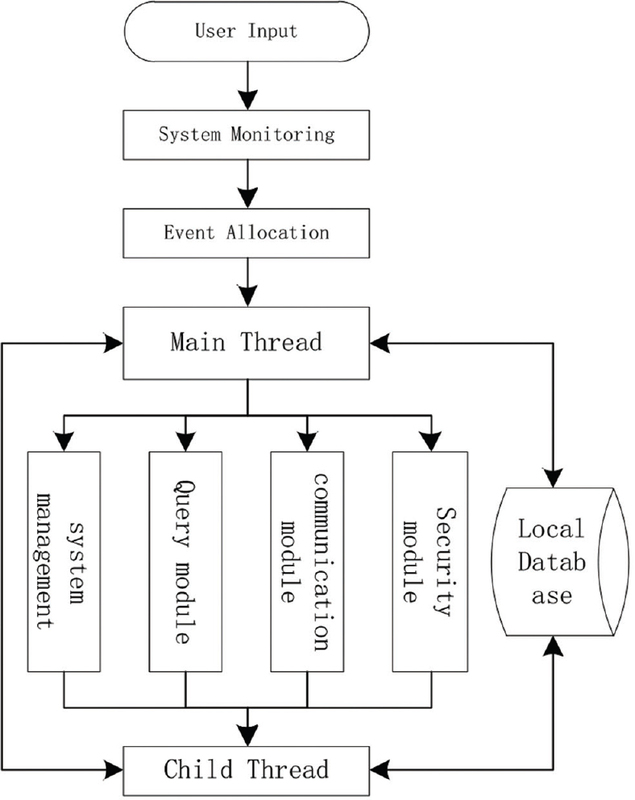 The data processed by the child thread are then returned or transmitted to the database. The system management module supervises the query module, accepts fingerprint queries, and polls the query results. The communication module ensures that the program runs in accordance with the standards of the public security network. The details of this process were shown in [Figure 2]. Data security is a core function of a mobile police terminal. Because fingerprint image data are extremely sensitive, the original image is not transmitted. Instead, the encrypted features are transmitted over the wireless network. Data are processed before transmission, as shown in [Figure 3]. In the feature extraction step, the most distinguishable information in the fingerprint image is extracted for fingerprint comparison. The encryption and compression of data are mainly done by the Ministry of Public Security. A certain password protection strength is used to ensure the security and reliability of the data. The fingerprint images collected by the mobile police terminal generally conform to the size of the fingerprint image on the ID card, namely, 256 pixels × 256 pixels. Because the ID card ID adopts a one-to-one fingerprint matching method, detail matching is specified as the matching method in GA/T1011-2012. The size of fingerprint images in AFIS is 640 pixels × 640 pixels. These images were collected by full finger area, so there are numerous fingerprint features. The fingerprint ID algorithm of the ID card and the AFIS fingerprint ID algorithm cannot changeless. The application scenario of identity authentication using AFIS is to confirm the identity of ID-free individuals; one-to-many fingerprint matching mode is required. Fingerprint comparison involves feature extraction, encryption, wireless transmission, and data forwarding. It has occupied a lot of time in message transmission from the mobile police terminal to AFIS system, so there left little time for fingerprint comparison. Therefore, a time-sensitive query queuing mechanism in AFIS is extremely important. Generally speaking, when a fingerprint query task arrives AFIS system from a mobile police terminal, the current comparison tasks in AFIS system should be suspended and make rooms for terminal's task immediately. However, this task is not simple for the following two reasons. First, the current comparison task is split into several comparators. If the current comparison task is to be paused and a new comparison task inserted, it must be determined which comparators need to be suspended, and the corresponding records must be recorded to ensure that the comparison task is resumed once the new comparison task has completed. This problem can generally be transformed into an operational research problem, and the optimal mission suspension strategy can be obtained. Second, because mobile police terminals have strict time sensitivity for fingerprint comparison, a multilevel and efficient fingerprint retrieval strategy must be adopted to match fingerprints quickly and accurately. It is desirable to compare as few fingerprint features as possible in the database when AFIS performs a fingerprint comparison. Generally speaking, two comparison strategies can be used. The first is a data sharing strategy, where data with similar fingerprint characteristics are distributed in different databases. This makes it possible for a query task index quickly to a location in some database server and parallelizes fingerprint comparison through a screening mechanism. For the second strategy, in the screening of similar fingerprints, it is possible to design some searching scheme for fingerprint retrieval. Fingerprint features can generally be divided into three levels, namely, local features (such as center points), triangle points, and special lines. These levels can be used to quick searching to fingerprints. A flow chart of a typical high-speed comparison mechanism for AFIS is shown in [Figure 4]. This study proposed a number of key technologies for mobile terminals for collecting fingerprints for fast comparison using AFIS. These technologies ensure intelligent mobile fingerprint collection and allow the transmission of fingerprint information from a terminal to AFIS, which has massive fingerprint and palmprint databases, over a wireless public security network for real-time fingerprint comparison. This study also analyzed the feasibility and effectiveness of the proposed technologies for system design and the applicability of fingerprint ID algorithms. The system achieved good results in a test by the Shanghai Public Security Bureau Criminal Investigation Corps. We would like to thank Adam Przywecki, B. Eng, from Liwen Bianji, Edanz Editing China (www.liwenbianji.cn/ac), for editing the English text of a draft of this manuscript. Zhanyun N. Research and practice of mobile police service platform in the field of public security. Police Technol 2014;2014:44-6. Xirui L, Hui W, Qinghai X, Xiude H, Shengli L, Yufeng L. Research progress of video forensics technology in mobile police support platform and application mode innovation. Police Technol 2016;2016:34-8. Yan C, Yu L, Qiang L, Bo Y, Yong W. Research on the construction and key technologies of police mobile information network. Police Technol 2016;2016:28-33.